When local nature walking club, Terra Verde, decided to plan another walk to Santiago but this time passing through a lesser known route via Braga, I decided that I had to join them. This walk would also take in the Minho region of northern Portugal which I have written about before (see the link here) and that I find is incredibly beautiful and unique. The route via Braga is not considered to be the traditional one to Santiago de Compostela but it was still used by pilgrims coming from the south-east of the country and eventually linked into the Roman route ‘Via XIX’ from Ponte de Lima up to Santiago. Beginning in Porto, it passes through Paranhos, S. Mamede, Nogueira de Maia, Silva Escura, S. Mamede do Coronado, Covelas, Esmeriz, Vila Nova de Familicão, Telhado, BRAGA, Merelim, Goães and finally Ponte de Lima. Unfortunately the route is not well marked with the traditional yellow arrow of the ‘Caminhos de Santiago’ but with some guidance from locals and a map in hand there is always hope. Fortunately Terra Verde began marking this route especially for our walk, pioneering and reopening the way for other pilgrims wishing to take this different route to Santiago. The first sector took us from the Sé Cathedral to Covelas in Trofa – 21 kms through the urban areas of Porto. 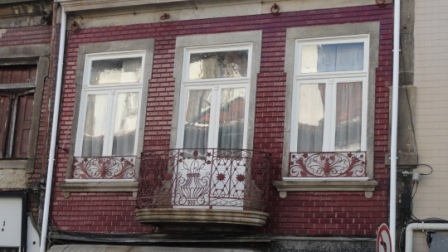 This is a fascinating way to discover part of the city and its people whilst observing the beautiful Portuguese architecture some of which is ‘antiga Portuguesa’ (buildings made from granite blocks with large windows and doors framed in granite and traditionally painted in white with dark green extras). There is a continuous array of old, two or three story, buildings covered in many different coloured tiles with magnificent windows and doors protected by wrought iron railing terraces. I am totally drawn to the old and worn out colourful, hand painted tiles (azuleijos) which can still be found on the exterior and interior of buildings everywhere and are just a treasure in themselves. 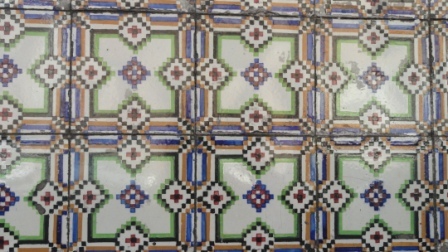 The traditional colours are blue and white but one can encounter many colour mixes with slightly imperfect patterns and it is sad to see them chipped and faded as time goes by. 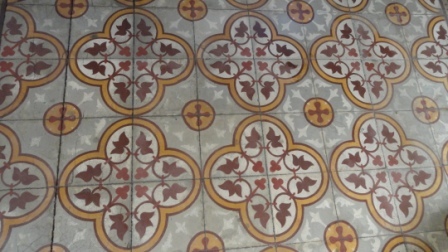 Azuleijos were originally used ornamentally and as a measure of controlling temperature. They were put up on major historic buildings where they narrated historical facts of days gone. The walk took us out of urban Porto and into villages, where we passed old manor houses with magnificent gates and doors, small chapels and churches with gilded alters, statues and hand painted ceilings – some dating back to the early 1700’s, small town squares with their granite pillory or ‘pelourinho’ posts which were once used for public punishment and humiliation. The Leça River (Rio Leça) accompanied us some of the way and one place in particular called Silva Escura has a documented history back to the year 920 where a very dense and almost impenetrable forest once existed! The history of each place is never ending and there is a yearning to stop and just wander to discover some of the treasures that these places have but there isn’t always enough time. From the small villages we moved into rural farm areas where we followed dirt tracks with green pastures on either side, people working on their farms and an array of lovely pets and farm animals. We closed the first stage of the walk at the small local church located in the parish of Covelas in Trofa. Although the start of this walk is rather urban it still gives one a chance to view Portuguese daily life and enjoy what the small towns and local people have to offer. Slide show of the walk below. Next sector Covelas to Santiago de Antas in Vila Nova de Familicão. 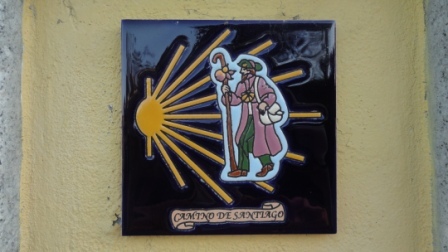 This entry was posted in Walk of St. James, Walking in Portugal, Walking in Spain & Portugal and tagged Braga to Santiago Compostela, Caminho de Santiago, Minho Province, Portugal, Portuguese History, Portuguese Tiles, Santiago de Compostela, Walking in Spain & Portugal, Way of St. James. Bookmark the permalink.